MID-ARGYLL: Mike Murray reports that nesting Barn and Tawny Owls appear to be doing well this summer. 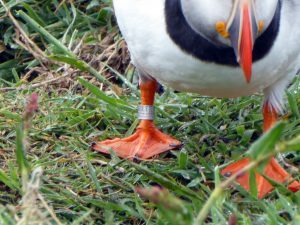 Mike was also out on Lunga, Treshnish Isles recently and got a photo of a ringed Puffin…presumably one of the birds ringed by the auk ringing group that visit each summer. Numbers there fluctuate each year around 3,000 or so apparently occupied burrows (per Robin Ward). 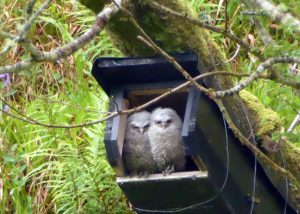 Tawny Owl young – Mid-Argyll May (Mike Murray). Puffin – Treshnish Isles May (Mike Murray).